Tupelo Honey for sale. Buy online at Zingerman's Mail Order. Gourmet Gifts. Food Gifts. What Van Morrison was so excited about. You may have seen this honey in the film Ulee's Gold starring Peter Fonda. Or heard about it listening to Van Morrison. Now you can taste it, too. 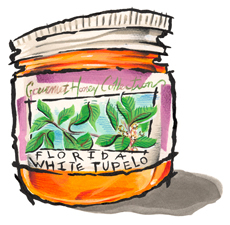 It's made exclusively in north Florida, along the Apalachicola River basin, where bees feed on the pale green flowers of the ogeechee tupelo, a shrubby tree that grows in the swamps. The hives are mounted on fourteen-foot platforms, and the honey is harvested in spring by beekeepers on barges. Sounds like a pretty interesting job. The honey is clear, its color deep gold. The texture is completely smooth, and it's pourable. The aroma is of flowers and caramel. The flavor is deceptively light at first—a hint of green apple—but grows to a crescendo of warmth at the back of the throat.